No, I’m not talking about meat that contains less fat or really healthy food! I’m talking about the Lean Six Sigma Manufacturing Techniques at work in your favorite fast-food restaurants. I attended an in-house Lean training a few months back taught by Paul Sheehy, one of Minitab’s technical training specialists. 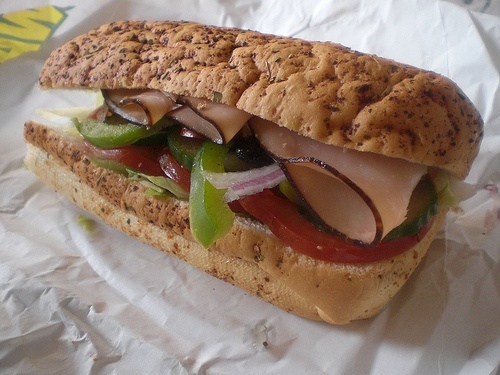 Paul explained Lean fundamentals through examples—including just some of the ways Subway sandwich shops employ Lean. One Piece Flow: One customer moves through the sandwich line, with an employee there to take your bread, meat, and cheese order, another employee there to place veggies on your sandwich, and another to run the cash register when your sandwich is made. As it gets busier, more employees are added to the line to keep things moving. 5S: Stands for Sort, Set in Order, Shine, Standardize, and Sustain—and exists as a lean tool to identify waste. Subway has all of the options for sandwich toppings in plain view of the customer, set in order by use (lettuce, tomato, provolone cheese, and mayo are within close-reach of the worker making the sandwich, while less used condiments are a further reach), and meats are pre-weighed to keep the sandwiches standardized. Lean Inventory: FIFO, or first-in-first-out rotation of Subway’s sandwich toppings keep the inventory freshest for the longest amount of time. Whenever a condiment becomes empty, several back-up bins are already prepared. The ‘older’ of the condiments is ‘first-out,’ while the newer condiments are placed in the back of the inventory. Chipotle and Qdoba: Both of these Mexican made-to-order restaurants are similar to Subway by employing One Piece Flow. These restaurants understand the importance of Takt Time, or the pace of customer demand. Their burritos are made on demand—just how the customer specifies, which eliminates the waste of having pre-made food hanging around that might go unsold. Gas Station Food: Many gas stations use touch-screen computers for customers ordering food. Their food orders go directly back to the kitchen, without any worker-customer interaction. This bypasses the need for the person ordering to move through the one piece flow assembly. These gas stations are using a facet of the 5S philosophy—“sorting” to remove unnecessary items from the workspace, which in this case is removing the person from the assembly process. This speeds things up by eliminating any slow-moving or indecisive people from the line. 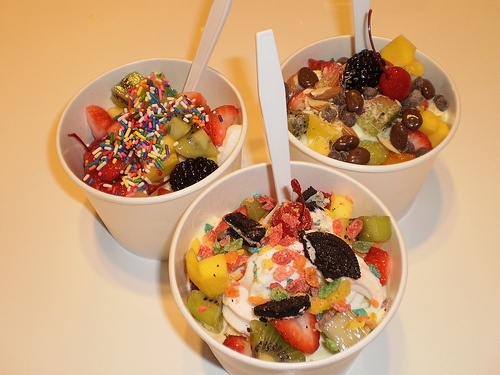 Frozen Yogurt: Right now, a food trend seems to be made-to-order soft-serve frozen yogurt with topping buffets. Assembly-line production at its finest: start at the beginning of the line and take a paper cup, move along the soft-serve line and choose the flavors you like, and then move through the topping buffet to get your fill of cookie dough bits and sprinkles—all before meeting the cashier at the end to pay for your treat. What restaurants have you been to that illustrate Lean concepts? Images are licensed under Creative Commons Attribution ShareAlike 2.0.